Compare prices from multiple car hire suppliers in Mirandela to find the best available deal. A few of the car rental companies we compare include Gold Car, Budget, Avis, Hertz, Sixt and many more. 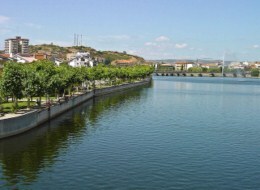 Mirandela is a municipality located in the Norte region of Portugal within the district of Braganca. It boasts a population of 25,780 inhabitants (2001) and is 658.96 square kilometers in size. It is comprised of 37 parishes, including Frechas, Vale de Gouvinhas, and Torre de Dona Chama. Some of the things to see in Mirandela are Riverside Park, a Roman-era bridge along the Tua River, a beautiful water fountain right by the Tua River, and the Matrix Church tower. Mirandela is serviced by the Braganca Municipal/Regional Airport (BGC). It is located 57.43 kilometers from the center of the city.